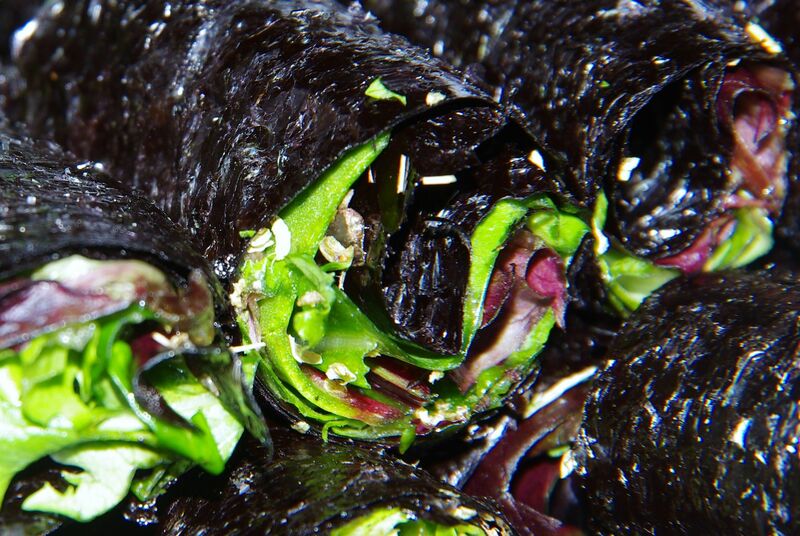 Most "nori wrap" recipes strive to mimic the appearance of sushi wrapped in nori. Many of these are delicious, fun, decorative and nutritious, but generally they are complex and easy to mess up. The following recipe and variations do not attempt to taste or appear like sushi wrapped in nori. My emphasis is on simplicity, flavor, and preparation speed. The basic recipe with none of the optional additions should only take you a couple minutes to make, and less than a minute to clean up. Nori wraps can be an excellent staple in any diet. This is the nori that I buy. I get it online in packets of 50 sheets. The price works out to about thirty cents per sheet. Nori, a seaweed, is a source of iodine, which protects your thyroid from trying to use other halogens (like flourine and cholorine) mistakenly, which damages the thyroid. 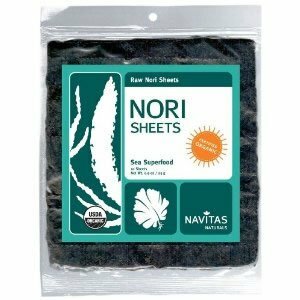 You'll find nutritional information on nori wraps at the bottom of this page. I recommend choosing one or two of the following to add. Trying to add all of these at once will overload the wrap unless you use much less than the recommended amounts. 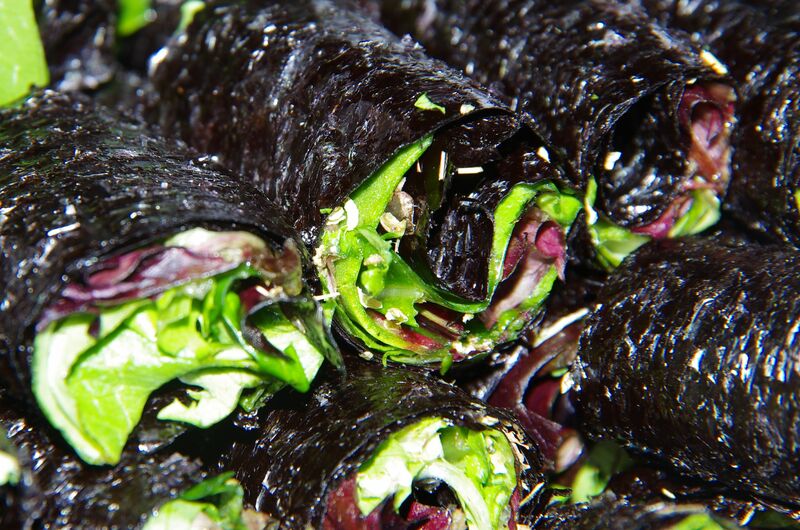 For each wrap you'll make, put a nori sheet on a plate. Add chopped onion, and other minced toppings, starting somewhat off center of the sheet. Add seasonings, lemon juice, tahini, coconut aminos and/or oil. 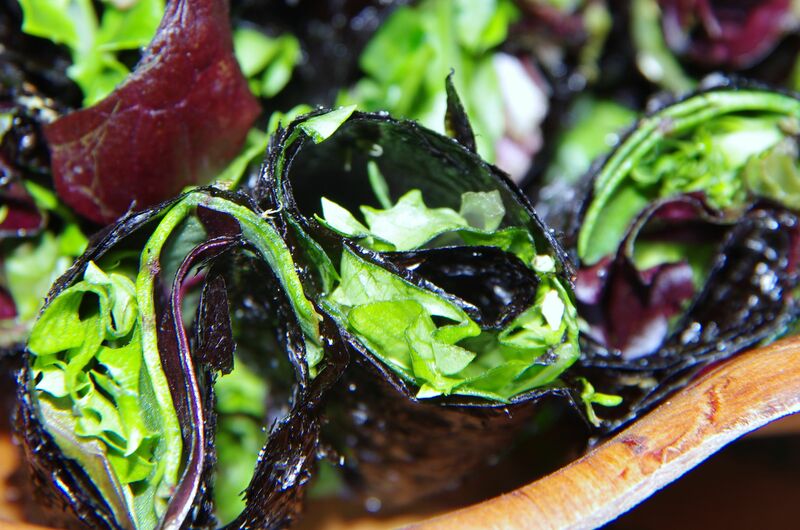 Remember not to get the filling too wet, as this will cause the nori wrap to fall apart. Take hold of the side of the nori where the toppings are close to the edge. Pull that edge over the toppings. Roll or pull the other side up and around. Nori can be made to stick together by slightly moistening it. You can rub a tomato slice or pineapple slice against it to get it slightly damp. Eat and enjoy the benefits of seaweed, greens, and raw food! Clean up is a cinch. If you pre-chop your onion and keep it in your fridge on-hand, there is the potential for not cleaning anything but your plate! At most, you only need to clean your knife, cutting board and plate. Have as many wraps as you like. They won't make you fat. When traveling, take along the nori packet and a glass-lock container (or jar with lid) containing the "guts" of the wrap. Bring a bamboo or wood plate (as these are light weight and not fragile). 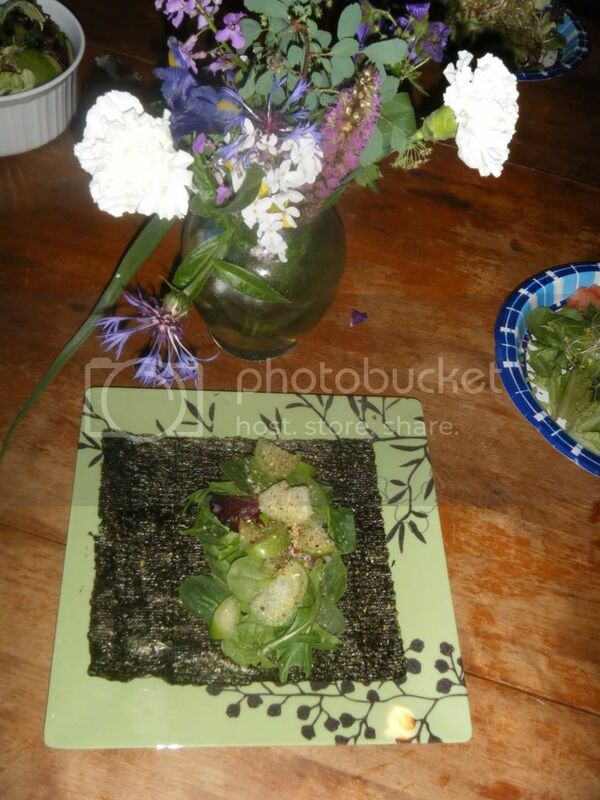 Then, anywhere you are, pull out the plate, put down the nori sheet, add the "guts" and roll it up. Ta da! Travel food for the win. 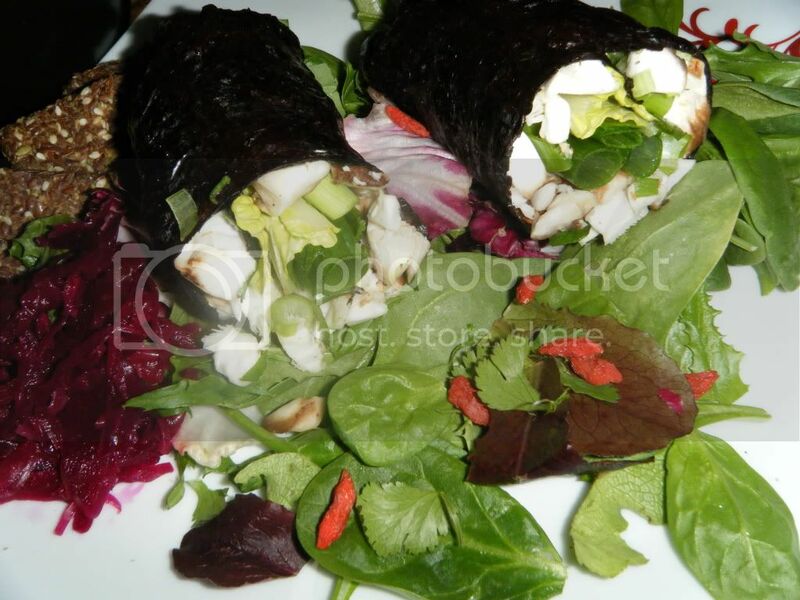 The nutritional analysis is based on two nori wraps consisting of the following. This is just a snack really, since this is only 152 calories. And yet, in those 152 calories, look at all that nutrition! Happy eating, loving & sharing!